So crazy about wine hues this season, looking beautiful, girl! Боже, ну какой же шикарный свитер! Beautiful outfit doll. 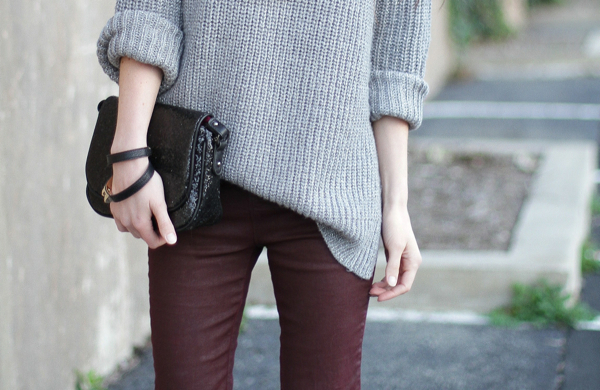 Love the burgundy pants with the chunky knit! so simple and very nice, love it! you look fabulous, love the coated burgundy pants.. I am loving those pants!! it's always so good to stop by your blog. where did you get your pants? they are so so awesome! Hope you had a great day. Comfortable, but very stylish look! Brava! Simple and chic! You're gorgeous! I am glad you are back! I love your posts... I can totally relate to the job getting on the way of my fun lately, hehehe, but I am trying to find more time to blog and do other fun activities as well. Look look so beautiful in these pics!! I love your gorgeous sweater! yes please. I love that grey with the maroon. so cozy chic! You are so gorgeous!! I love this look<3 great for casual outings! Nice hair too! ^^ Any hints on getting smoother hair for us? hehe. A pinched nerve is a disease that occurs due to neurological damage as a result of pressure, pressure either directly or indirectly. Pinched nerve illness that is often taken lightly and considered one eye. Pinched nerve can cause a decrease in nervous system delivers the signal from the brain or vice versa. If you would like to see the past, take a look at the present situation. If you would like to see the future so look at what you are doing now.